Experience innovation. Collaborate with us to accelerate your success. Research concepts. Test products. Help diversify and grow our economy…and your business. Students will study here and collaborate to innovate with faculty, industry and community partners on relevant research projects to turn ideas into products and grow the regional economy. Listen to what our government and industry supporters have to say about what the Peter B. Moore Advanced Technology Centre means to our community and economy. 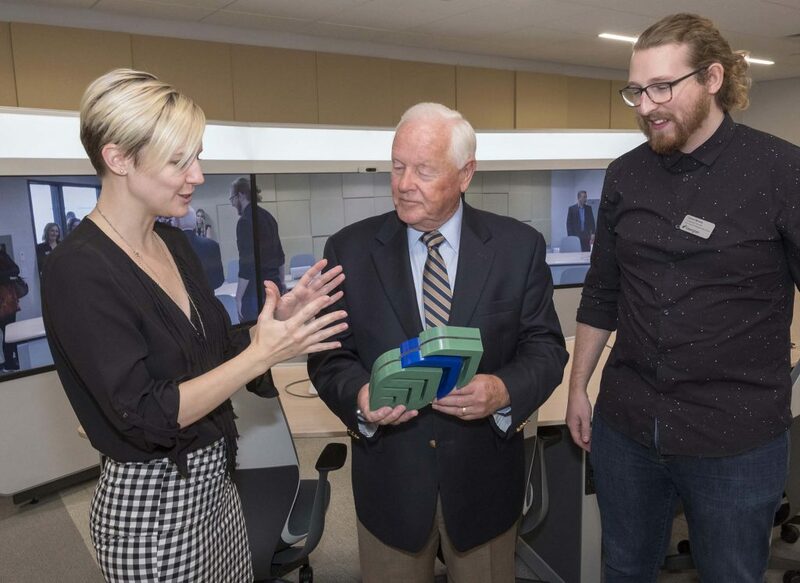 The Peter B. Moore Advanced Technology Centre officially opened on Nov. 15. More than 200 people from all levels of government, industry partners, major donors and the community took part in the celebration. A highlight of the event was an announcement by local philanthropist, entrepreneur and owner of Moore Packaging, Peter Moore, who made a major donation in support of the facility and research and innovation that will take place within its walls. The Advanced Technology Centre is best seen in person but until you can visit our campus, these photos will show you many of the features of the building. Four levels of government, generous industry and private donors all contributed, knowing this centre will be a catalyst for the prosperity and competitive advantage of Central Ontario. In addition to the contributors featured below, we are also grateful to AutoIQ.ca Network of Dealerships and Jane Brown Jackson for their support. The Government of Canada, the Province of Ontario, the County of Simcoe and the City of Barrie each contributed to this project, acknowledging its importance to the growth of Central Ontario’s economy. One in four employees at Innovative Automation is a Georgian graduate. In recognition of how important the college is to training its workforce, the company invested $250,000 in this epicentre of local innovation. Alectra chose to invest $750,000 over five years in changemaking research and innovation that will take place in this new centre, to support economic efficiency, social equity and environmental accountability. ABSC donated $1 million to this building because its industry is driven to innovate to be competitive, environmentally responsible and address changing customer demand. Bring your ideas to life with our Research and Innovation team. If you’re a non-profit or want to start a social enterprise, connect with the Centre for Changemaking and Social Innovation. Start a business at the Henry Bernick Entrepreneurship Centre.